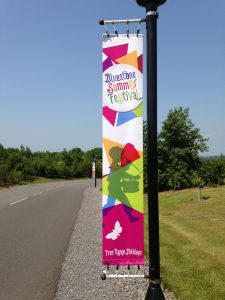 Produced in-house using quality materials, we can offer banners to suit any requirements at any size. Digitally printed using genuine Roland Eco Sol Max inks, for stunning print quality, durability and vibrancy. Most importantly, we offer a very fast turnaround for standard products, produced to suit your requirement, whether for a long term permanent display or a temporary birthday banner, all are seamed, stitched and eyeletted and are available as single/double sided or as a mesh. As well as PVC, we can produce a range of products onto alternative materials and can ship to anywhere throughout the UK. Because we print onto roll fed material and all our products are made to order, there is no real standard size. However the majority of sizes are 8′ x 2′ or 10′ x 3′ but we can make to any size or quantity you mat require. We also offer, budget and premium materials for long and short term solutions. Please contact us for a speedy quotation or if you require any more information regarding any of our products or services.